Recently I asked for your advice on which bed to purchase. My husband is 6’4″, so he said no footboards, and after all your feedback on Facebook, we are going with the Alexa Reclaimed Wood Bed from West Elm. I saw this new duvet set arrived at Anthro and immediately snagged it: Gaeta Duvet. It seemed to be exactly what I have been searching for, and when it arrived yesterday I was happy to see I was right. I luuurve it. Just the right amount of detail, and so soft and puffy to cuddle into. This pillow is probably too busy with my new bedding, but man do I love it. Oaxaca Lumbar pillow from The Citizenry. I might take Jacinda’s suggestion and just make one small, simple, luxurious brown leather pillow to place right in the center of the bed. I currently have two of our favorite stool at the foot of my bed, on top of a gorgeous, perfect red and blue camel-hair woven rug I picked up when our whole family went to Jordan a couple of years ago. I love these stools but the way they are placed close to the french doors leading to the garden means we bust our toes up on them all the time. I’d like to move them to a safer location and replace their spot at the foot of the bed with this elegant Leather Director’s Bench from CB2. We have two beautiful ceramic table lamps, similar to this Cosgrove Mid Century Lamp from Lamps Plus. 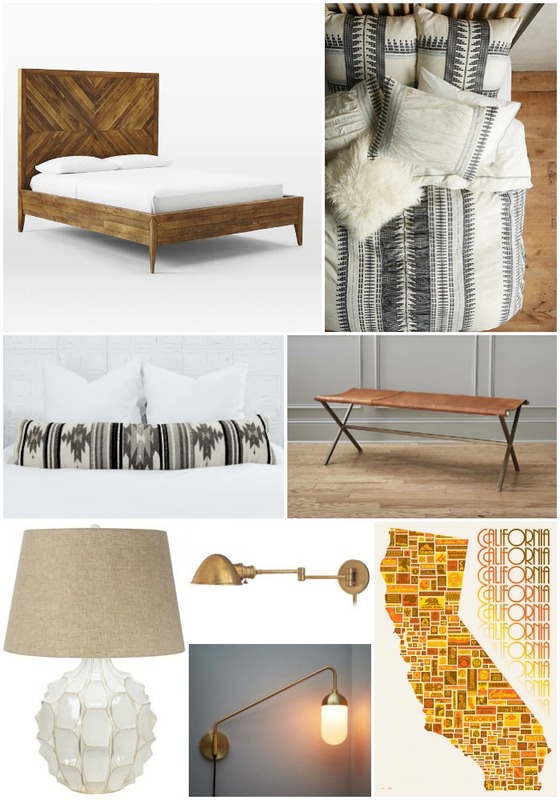 They do take up a lot of nightstand space, so I am considering switching to some simple brass swing arms like the Newport Aged Brass from Lamps Plus or the Long Gooseneck Pelle from West Elm. Any pros and cons to this that you can think of? We have a beloved, extra large framed Ork Poster of Los Angeles in a similar colorway, but I’m also digging this California Compiled print from Upper Playground. Gotta show my born-and-raised California pride. I am hoping this new look has a good amount of quality detail, but is still simple and soothing. What do you think?